Restore and replenish skin with the Galactomyces Alcohol-Free Toner from Korean skincare brand, COSRX. Free from alcohol and skin-irritating ingredients, the moisturising toner glides effortlessly across skin, refreshing rejuvenating and renewing to lend the complexion a revived and healthy appearance. Its dose of Mineral Water promotes maximum hydration, whilst Galactomyces Fermentation Techonology nourishes, moisturises and tones. Skin is left feeling fresh, comfortable and restored. Use after cleansing. Apply an adequate amount onto a cotton pad (enough to soak it) and massage gently from the inside to the outside edge of the face, allowing the skin to absorb the product. Mineral Water, Galactomyces Ferment Filtrate, Butylene Glycol, 1,2-Hexanediol, Betaine, Panthenol, Allantoin, Sodium Hyaluronate, Cassia Obtusifolia Seed Extract , Ethyl Hexanediol. 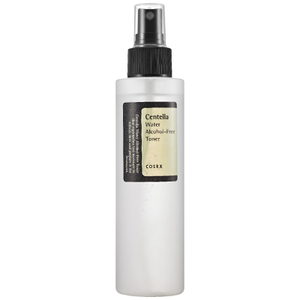 This toner delivers with a smooth effect. A great value at a reasonable price.